Bring warmth into your space with wooden blinds. Whether you choose an oak or painted finish, wooden Blinds are a subtle and simple way to revamp your windows. 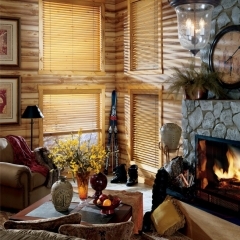 Wood blinds can be made from a variety of woods, including basswood, abachi and ash (basswood being the most common). Wood blinds are known for their luxurious and sophisticated look which faux wood can come close to but not duplicate completely. The natural look of wooden blinds adds character and style to any room and their timeless beauty and natural characteristics can now be seen in contemporary and traditional rooms throughout the world. Wood Blinds are the ideal accessories to compliment wooden floors and are available in the popular natural shade along with some new and exciting colors. These blinds come in a variety of finishes as well, allowing you to choose a neutral tone or black or white for your blinds. Wood blinds are also actually lighter in weight than faux wood blinds making them especially great for extra large windows and for lasting durability. While faux wood blinds are easier to maintain than real wood blinds because of their resistance to moisture, you can still clean real wood blinds relatively easily using a damp cloth and a specialized wood cleaner if necessary. There are pros and cons to purchasing wooden blinds for your home. 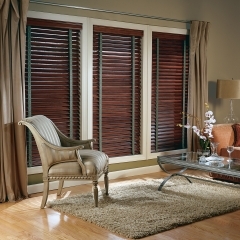 Contact DC Shutters for Wood Blinds in Brampton, Oakville, Kitchener, Waterloo, Hamilton, Niagara, Toronto, Richmond Hill, Aurora, Newmarket, Ajax, Whitby, and Oshawa.